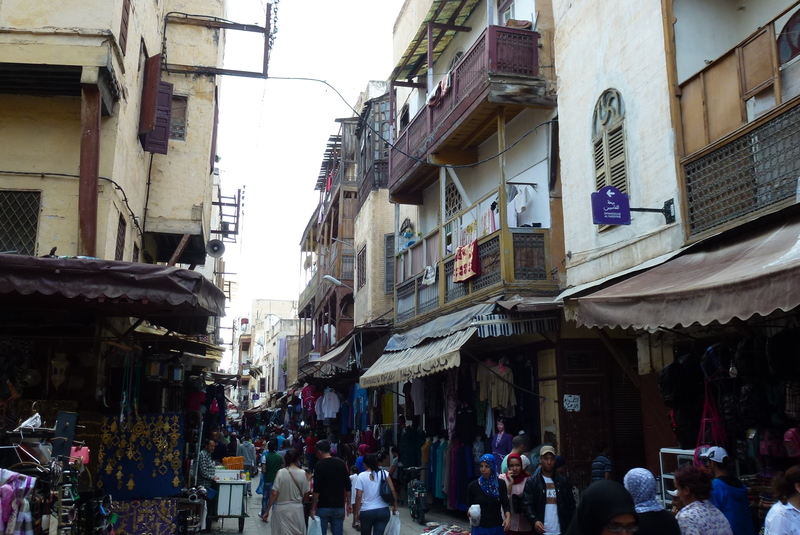 In addition to those sights mentioned in my first post on Fez, Morocco here are a few others. We enjoyed getting a feel for “real” life in Fez. Tanneries. 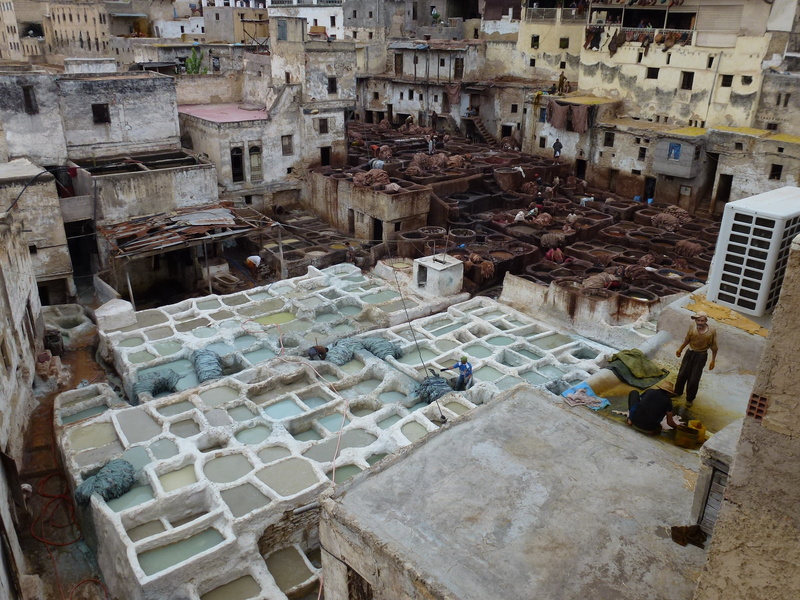 One of the highlights of a visit to Fez is a visit to the tanneries. 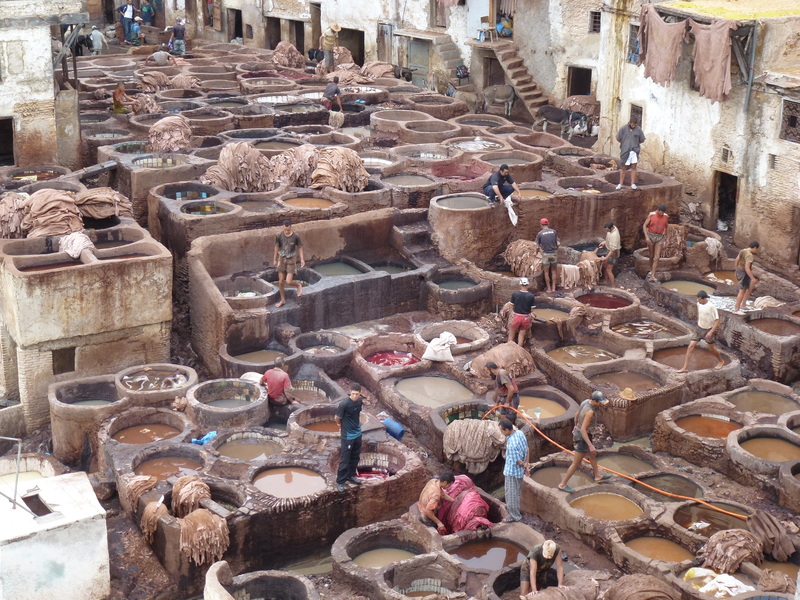 These tanneries are world famous and a real sight to behold. They were the commercial backbone of Fez for hundreds of years. The process hasn’t changed much in all that time, although more sophisticated chemical treatments are used more frequently now rather than the natural dyes used in the past. The workers pass down their knowledge and skills from one generation to the next. An overlook of Chouwara Tanneries. 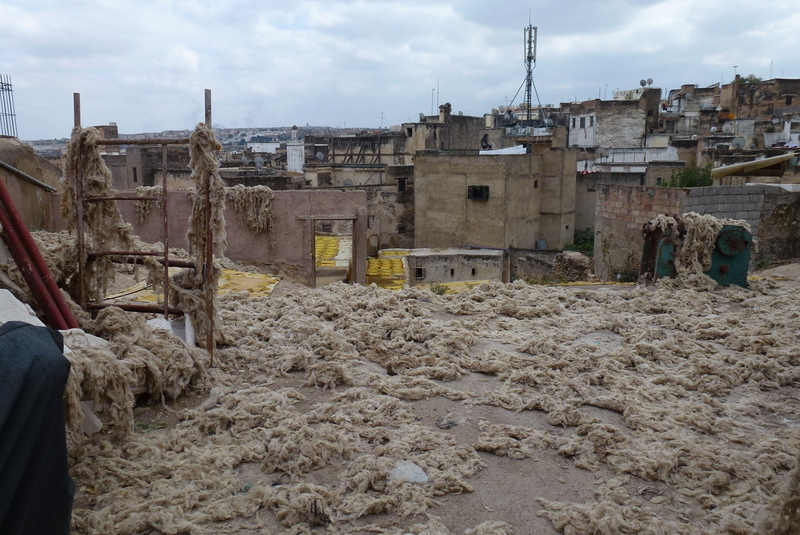 The white vats in the foreground contain pigeon dung, used to clean the skins. If you want to gain a new appreciation for your own job, just observe the workers here for awhile. Although fun to watch, I can’t imagine what life would be like standing in these vats day after day breathing in the strong odors and working in these conditions for a lifetime. 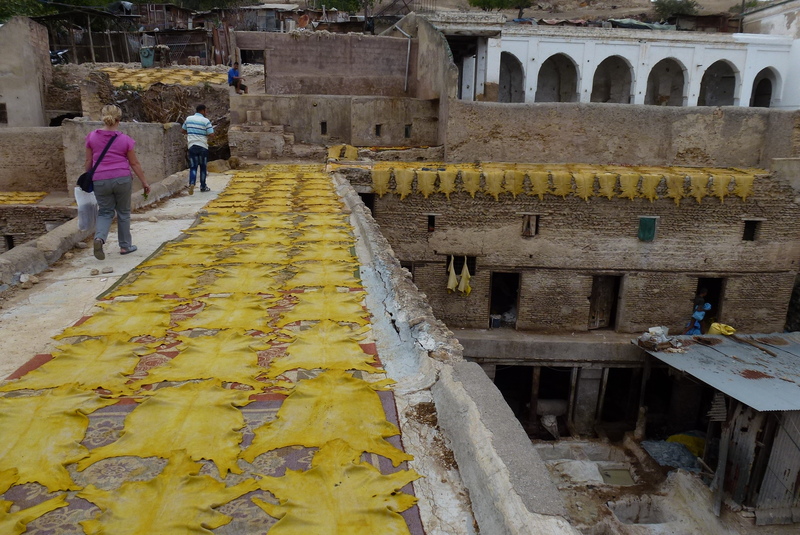 The large Chouwara tannery is located on the southern side of the Medina and while there aren’t signs pointing the way, just ask anyone for directions. There are several viewing areas located above leather goods shops. The proprietors will provide you with mint leaves to alleviate the smells. 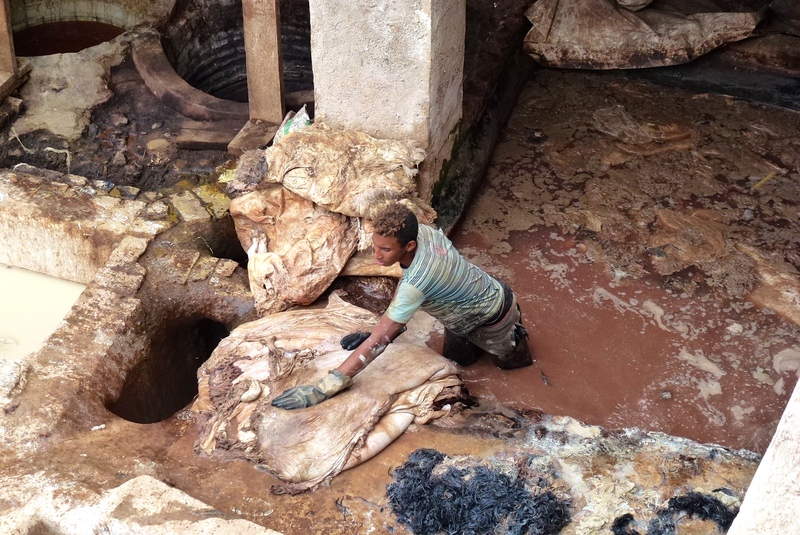 A closer look at the Chouwara Tanneries. The workers are constantly moving from vat to vat to keep the skins moving through the process. Once you have observed the tanning process and workers, you then exit through the huge shops where can buy high quality leather jackets, purses and other leather goods for a pretty reasonable price. Surprisingly, there was no pressure to buy anything. My guess is that with the volume of tourists coming here, the shops do a pretty good business. 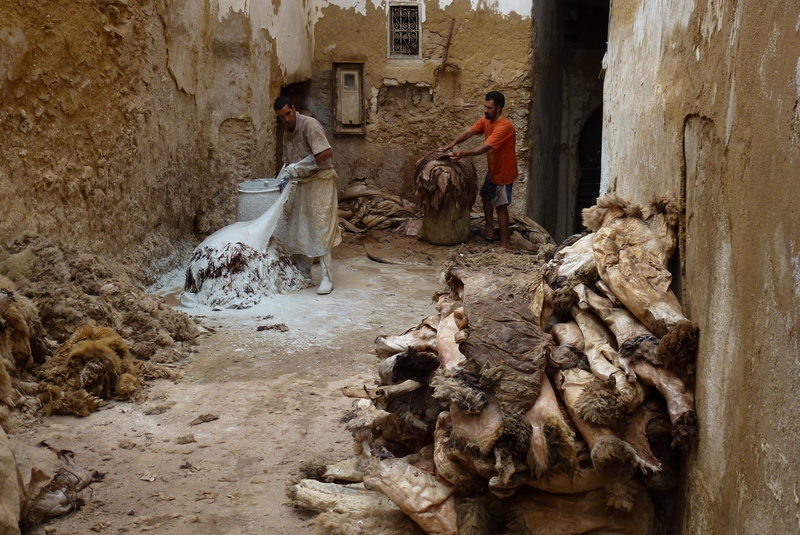 We happened by chance upon the Gueliz tannery located in the heart of the Medina. Our book seemed to downplay a visit here but Gueliz was actually a lot of fun and a more intimate experience, since you can walk through the middle of the tanning “factory” and among the workers treating the hides. The recently skinned sheep hides await the first step in the processing. A worker in the vats at Gueliz tannery. I am really glad I don’t have his job! Colored sheep hides laying out to dry. These will be made into shoes, purses and other goods. 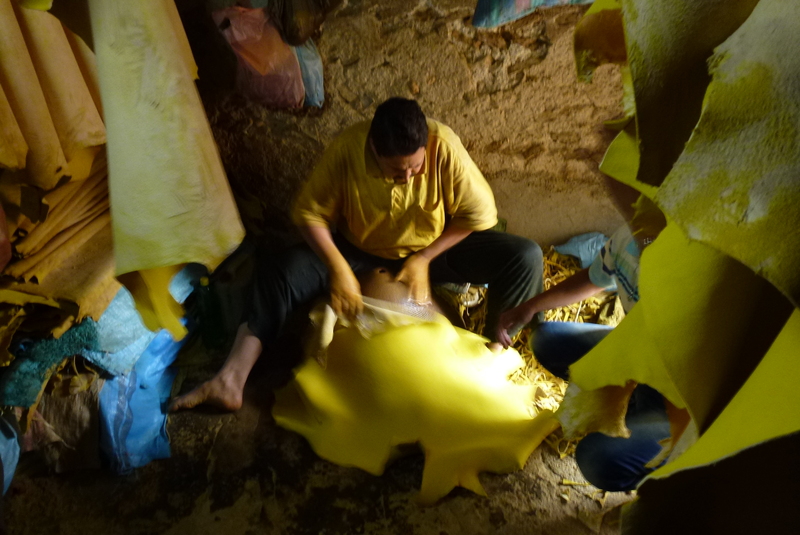 A worker doing some final processing of the leather before it turns into a product for sale. At this tannery there was a Berber side and an Arab side, an arrangement probably dating back among these ethnic groups hundreds of years. We met some Berber families who accompanied their husbands to Fez to work here and were staying at a “hotel” (if you can use that word to describe the living quarters). 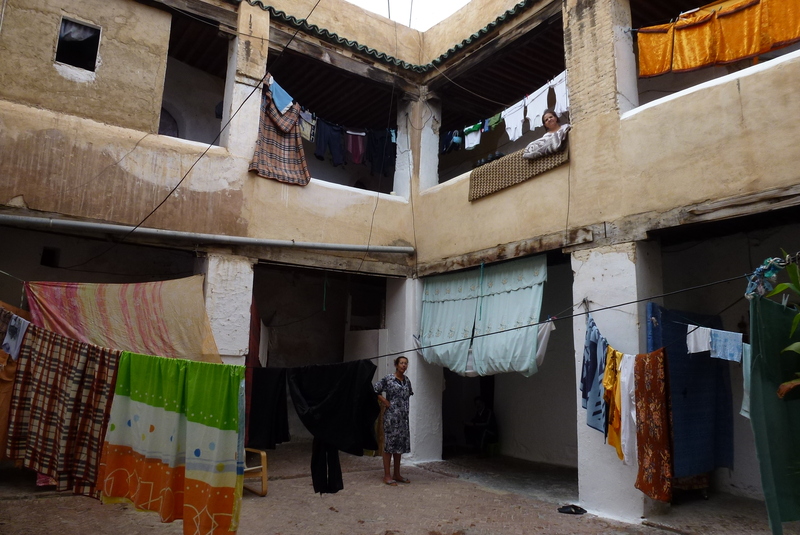 The Berber “hotel” where families of the tannery’s workers are housed. Craft shops. On a hillside right behind and above the Gueliz tannery was a craft shop area. When we first entered, we thought it was a slum community and what we found in reality was a beehive of industry – wool, leather, woodworking, and many other crafts. People were everywhere producing and refurbishing many goods. The craft shops area in Fez. In the craft shop area – wool, wool everywhere! 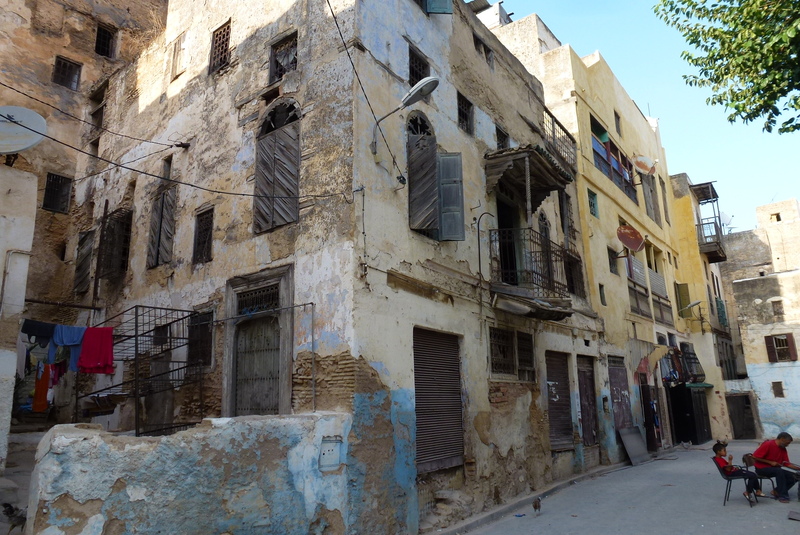 The Jewish Quarter (Mellah). 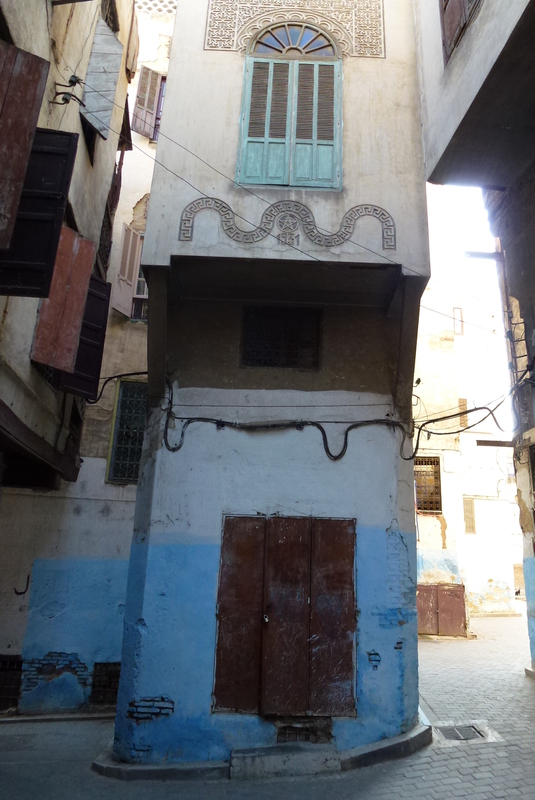 This is an old part of Fez that doesn’t have any sights per se but was fun to wander around, seeing all the old decrepit buildings and signs of a thriving Jewish community. A view of a main street in the Jewish Quarter, known as Mellah (“salt” in Arabic). Fez had a pretty good size Jewish community in the 17th – 19th centuries and there are remnants from this era – some unique architecture, a few Hebrew signs, Stars of David, synagogues and cemetery. 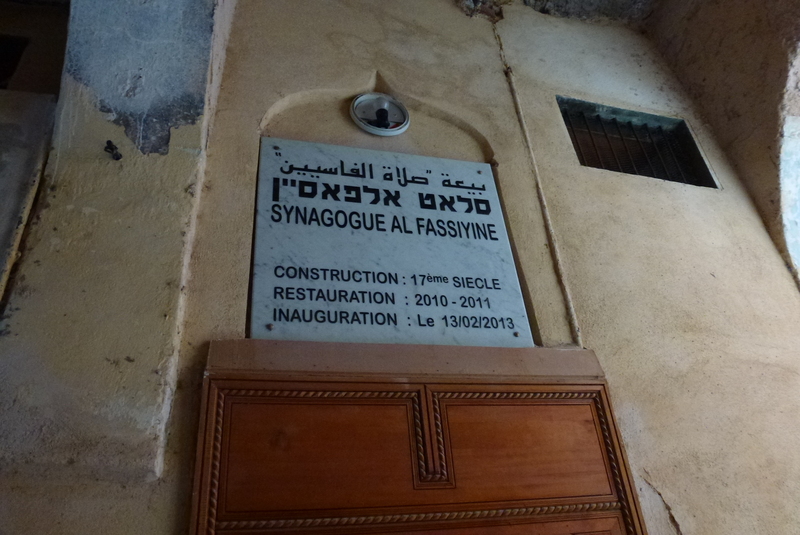 A sign noting this building is a 17th century synagogue. Look closely at the decorations on the 2nd story and you’ll see a Star of David, and note the year – 1531. It is now an area inhabited by poor Muslim immigrants from the countryside. Shuttered windows in the Jewish Quarter, which are unique features of this area. 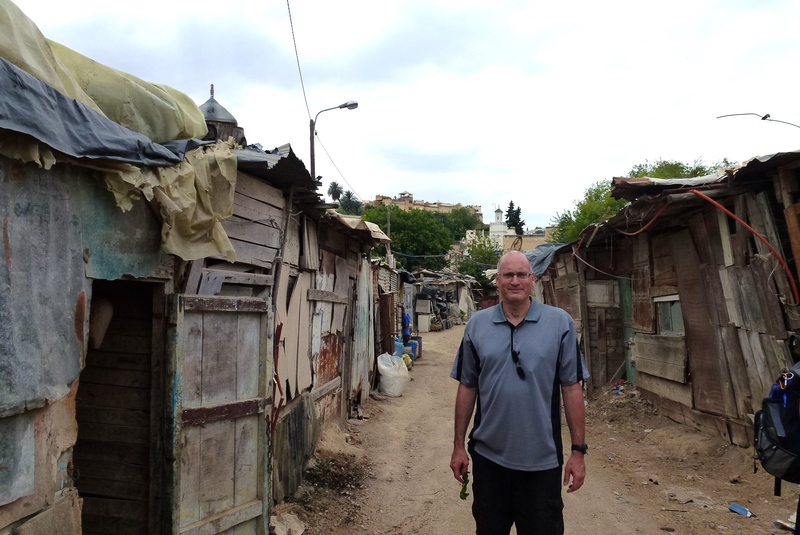 There are still a few Jewish families here, although most emigrated to Casablanca, France or Israel after Morocco gained its independence from France in 1956. 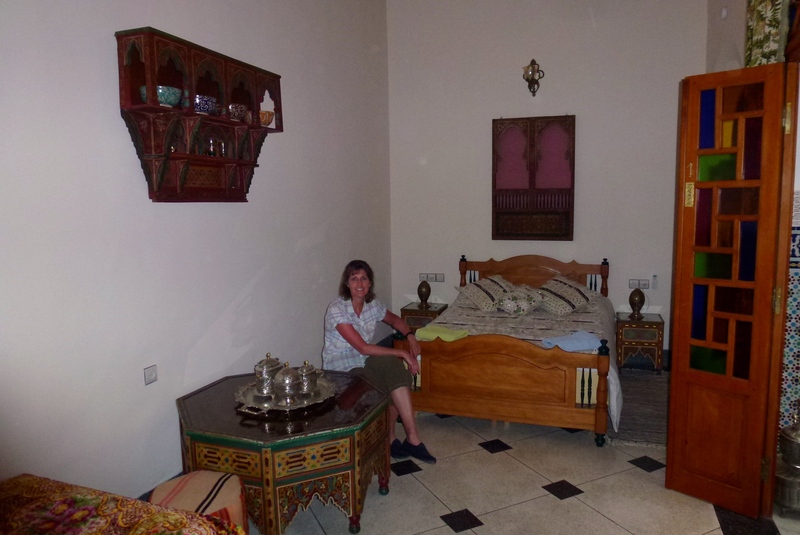 We had a great hotel in Fez, called Dar Dalila. It was in the Medina, but in a quiet section near the exterior Medina wall. The interior was beautiful and our room was large and comfortable. I highly recommend this location. Nearby was a covered car park since a car is pretty much useless in the Medina. 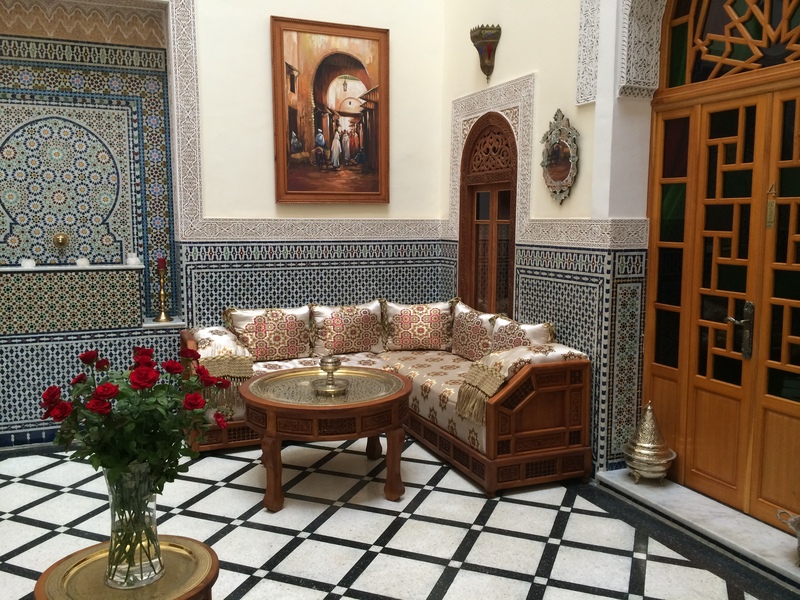 The reception room in Dar Dalila. Our room in Dar Dalila. Fez is definitely one of the highlights of a visit to Morocco and one of the most unique and fascinating places to visit in the world. Reference: The Rough Guide to Morocco. Excellent gallery and write up! Fez is photographers dream. Thanks, it is a fantastic place.